I have to give all the credit for this project to my husband. 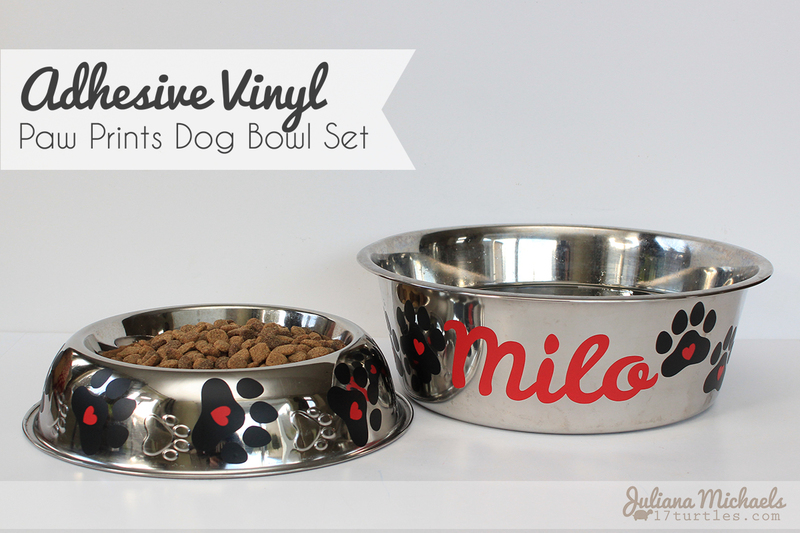 When I was trying to think of something fun to create with SRM Stickers Adhesive Vinyl, he suggested that I decorate Milo's food and water bowl. The idea was born, so I set to work creating a digital cutting file to use. I cut enough paw prints to go all the way around the food bowl from black vinyl and then added little red vinyl hearts to the middle of each one. For the water bowl, I repeated the paw prints and hearts and then I cut his name from red vinyl. So what do you think? I love how it dresses up his bowls in such a simple but stylish way. 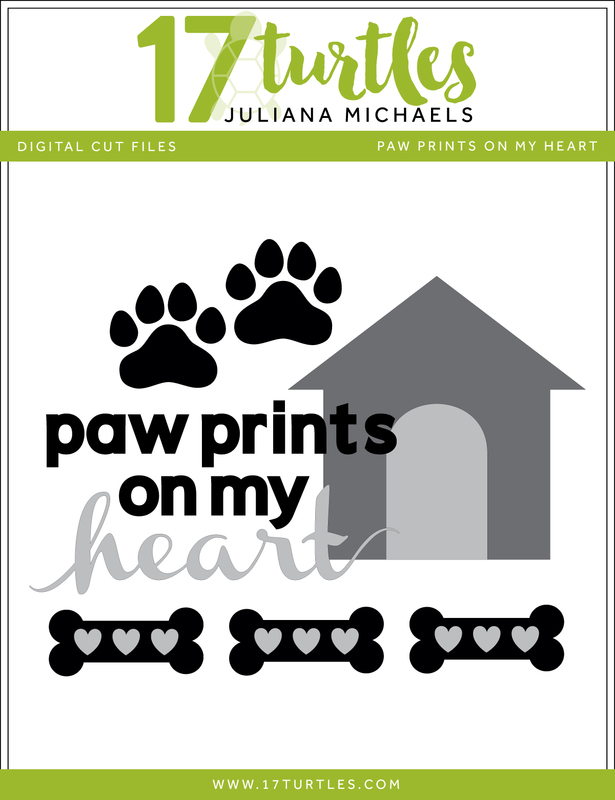 If you are interested in the images I used, you can download my Paw Prints cut file for FREE below. Some of you may or may not know, but Milo is our 10 year old golden retriever. We adopted him this past fall and he has filled our lives with so much love and joy. He has definitely left his paw prints on my heart. As you can see, he really seemed to enjoy his newly decorated bowls. I'm sure it had nothing to do with the fact that I feed him a little treat to get these photos! Thanks so much for your visit today and I hope you enjoyed my project. You can see more images of the bowls on the SRM Stickers blog. 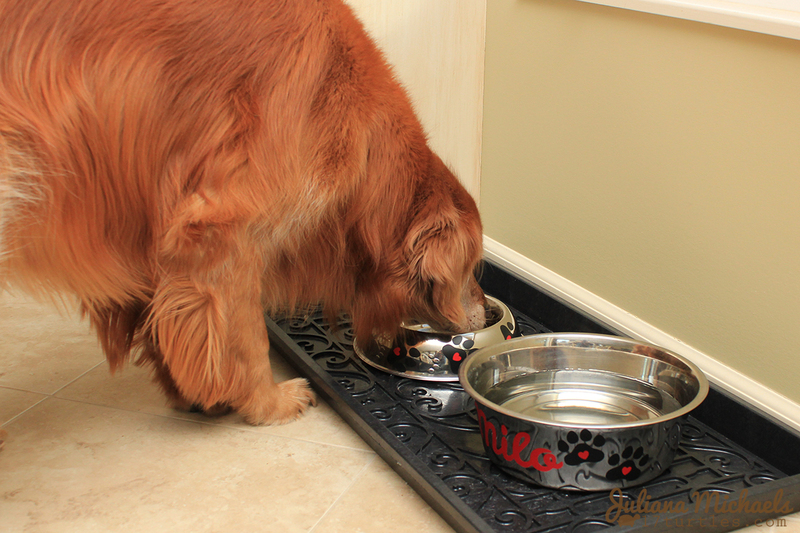 Thank you, your doggie bowls are too cute! How cute Juliana!! Looks like he is enjoying his customized bowls!! How cute!!! Milo is sure to enjoy his designer bowls!! And thanks for the file..I can see it coming in very handy!! You are so talented and wonderful for sharing!! Thanks! !